Background Little is known of the incidence of adverse events in the paediatric intensive care unit (PICU). Perceived incidence may be dependent on data-collection methods. Objective To determine the incidence of adverse events by voluntary reporting and systematic enquiry. Methods Adverse events in PICU were recorded contemporaneously by systematic enquiry with bedside nurses and attending doctors, and compared with data submitted voluntarily to the hospital's quality and safety unit. Events were classified as insignificant, minor, moderate, major and catastrophic or lethal, and assigned origins as medical/surgical diagnosis or management, medical/surgical procedures, medication or miscellaneous. Results Among 740 patients, 524 adverse events (mean 0.71 per patient) occurred in 193 patients (26.1%). Systematic enquiry detected 405 (80%) among 165 patients and were classified by one investigator as insignificant 30 (7%); minor 100 (25%); moderate 160 (37%); major 103(25%) and catastrophic 12 (3%). The coefficient of agreement (kappa) of severity between the two investigators was 0.82 (95% CI 0.78–0.87). Voluntary reporting detected 166 (32%) adverse events among 100 patients, of which 119 were undetected by systematic reporting. Forty-nine events (9%) were detected by both methods. The number and severity of events reported by the two methods were significantly different (p<0.0001). Voluntary reporting, mainly by nurses, did not capture major, severe or catastrophic events related to medical/surgical diagnosis or management. Conclusions Neither voluntary reporting nor systematic enquiry captures all adverse events. While the two methods both capture some events, systematic reporting captures serious events, while voluntary reporting captures mainly insignificant and minor events. The purpose of this study was to determine the contemporaneous incidence of adverse events by systematic enquiry in a paediatric intensive care unit and to compare it with voluntary reporting. The study was conducted in the paediatric intensive care unit (PICU) at the Royal Children's Hospital (RCH), Melbourne, Victoria, Australia. RCH is one of two state paediatric tertiary referral hospitals and houses the principal ICU. The state has a population of 6 million, of whom one million are children (<15 years). The PICU has 15 high-acuity beds, is the national extracorporeal membrane oxygenation (ECMO) referral centre and operates a paediatric emergency retrieval service for the States of Victoria, Tasmania and southern New South Wales. The annual admissions for 2006–2007 were 1329, of whom 73% received mechanical ventilation via endotracheal intubation. The mortality was 4.36%, and average duration of admission 3.86 days. All patients admitted to the PICU were studied on 176 days in the period from June 2006 to May 2007 when both investigators were available. The need for informed consent was waived by the hospital's human research ethics committee. The patients included all ages from infancy to 19 years and were representative of the different childhood illnesses/disorders. The routine reporting process of adverse events in the hospital is conducted on a voluntary basis either by paper submission or on-line by ‘RiskMan,’ which is an incident-reporting system (Port Melbourne, Australia, 3207). It is available at all hours every day. ‘RiskMan’ requests details of the incident including those of the patient, identification of the informer, classification and contributing factors to the event. An option exists to complete the report anonymously. The information sought under the term ‘adverse events’ related to harm defined as any unintended physical injury resulting from or contributed to by medical care or error including the absence of indicated medical treatment that required additional monitoring, treatment or hospitalisation or which resulted in death. The injury was considered harm, irrespective of whether or not it was considered preventable. ‘Near misses’ and complications associated with illness were excluded. Systematic reporting was conducted in a stepwise fashion. This began with attendance by one investigator at the morning medical staff patient hand-over meeting. This was followed during the day (08:00–18:00) by conductance by both medical investigators of a ‘quality in care’ bedside ward round on week or weekend days, which involved the attending medical and nursing staff with additional requested input from the nurse manager and the senior medical staff on duty. The patient's case notes, medication and observation charts were also reviewed along with laboratory and diagnostic tests. An initial open-ended question to bedside nurses and attending doctors ‘Has any adverse event occurred with this patient?’ was followed by specific questions related to, for example, drug errors, delays in initiating treatment/procedures, need for additional surgeries, any care thought to be suboptimal or which resulted in additional investigations or a longer duration of hospital stay. Parental opinion as to perceived quality of care was also obtained when possible. A record was made of a repeat admission from the medical/surgical wards within a 24 h period of transfer as well as cancellation and delay in surgical procedures. Potential events were followed on a daily basis to determine if actual harm had resulted. Some patients required follow-up after they were discharged from the PICU to other wards or to their homes in order to determine the severity of an adverse event. The causes of adverse events were classified as due to management decisions, medical or surgical procedures, medication errors or other therapeutic care. catastrophic: unexpected or preventable death or permanent disability. In the category of ‘insignificant’ outcome, actual harm may not have been identifiable, even though an adverse event such as a drug dose error had actually occurred in contrast to a discarded ‘near miss’ event in which the error was detected before drug administration. The two investigators independently applied their own severity ratings to each systematically detected event, which were then compared to determine the inter-rater agreement by calculation of κ. The first investigator alone applied severity ratings to voluntary reported events. Outcomes captured by systematic enquiry and voluntary reporting and scored by the first investigator were compared with the Fisher exact test using Stata 9.0 (StataCorp, College Station, Texas). One hundred and sixty-five patients were determined by systematic enquiry to have sustained an adverse event. These patients had a total of 405 adverse events, with 96 having a single event, 69 having two or more, and 21 patients recording at least five or more. The impacts of these adverse events, classified by their outcome consequence according to the first investigator, were: insignificant 30 (7%), minor 100 (25%), moderate 160 (37%), major 103(25%) and catastrophic 12 (3%). The severity of adverse events was judged independently by the second investigator and compared with that of the first investigator. The coefficient of agreement (κ, κ;) between the two investigators was 0.82 (95% CIs 0.78 to 0.87). The origins of adverse events were medical/surgical management decisions 59%, medical/surgical procedures 28%, medication errors 11%, and miscellaneous 2%. Voluntary reporting captured 166 adverse events among 100 patients. The majority of voluntary reports (148, 89%) were by nurses, and the events were insignificant, minor or of moderate severity. Only four major events were reported, and these were by doctors (figure 1). The first investigator classified the severity of voluntarily reported events as: 33 (20%) insignificant; 117 (71%) minor; 12 (7%) as moderate; 4 (2%) and none as catastrophic. Of the 100 patients with voluntarily reported events, 37 had two or more events. Of these 100 patients, 28 had not been included in the systematic study, each had a single adverse event, and the 16 patients recorded by both methods had an additional 23 adverse events not detected in the systematic study. Voluntary reported events were medical/surgical management decisions 3%, medical/surgical procedures 53%, medication errors 42% and miscellaneous 2%. Comparison of adverse events reported voluntarily and systematically. The combination of systematic and voluntary reporting yielded a total of 524 adverse events occurring among 193 in a total of 740 patients (26.1%), which is an average of 0.71 events per PICU patient. Systematic study captured 405 events (77%), whereas voluntary reporting captured 166 (32%), with 119 being undetected by systematic reporting. Forty-nine events (9% of total), were captured by both methods, of which 28 (57%) had insignificant, and 21 (43%) had minor outcomes. 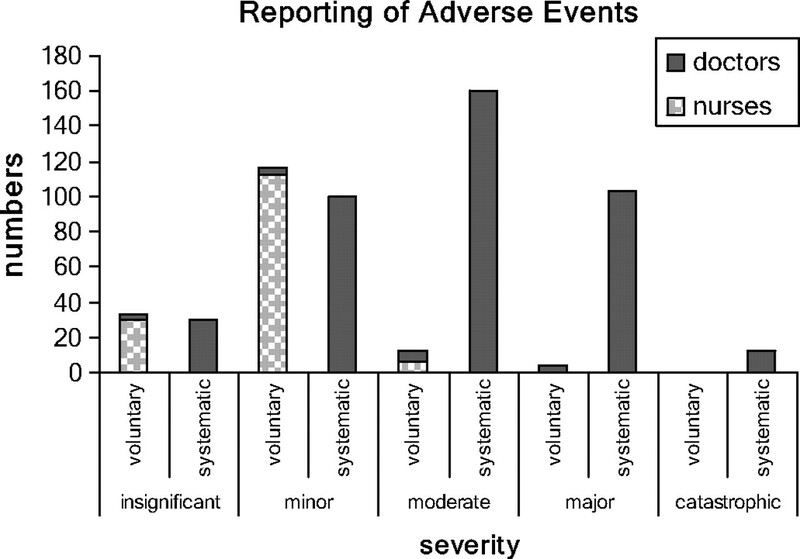 The quantity and severity of adverse events were significantly different between reporting methods (p<0.0001). Adverse events occur more frequently in the adult intensive care unit setting, as shown by a study15 which found that 20.2% of patients sustained an adverse event, of which 55% were deemed non-preventable and 45% preventable, and of which 13% were life-threatening or fatal. Similarly, the PICU environment is risk-laden, but the incidence and severity of adverse events may be attributed in part to the method of study. The number of patients in our PICU sustaining an adverse event at 26% (0.7 events per patient) is higher than in another PICU at 8% (0.11 events per patient).8 The lower incidence in the latter may be explained by the absence of admission of patients of greater complexity, including those requiring solid organ transplantation, extracorporeal membrane oxygenation or difficult cardiac surgery. In other respects, however, the methodology in that study was similar to our study: it was prospective with evaluation of adverse events by physicians, and although the incidence of adverse events was smaller, a preponderance of the events were similarly classified as significant with 52% of children having a major outcome (including two direct deaths), 33% moderate and 16% minor outcomes. In contrast, in another PICU study conducted by doctors and nurses by retrospective chart review,7 the incidence of adverse events was very high, with 59% of patients sustaining an adverse event (1.96 events per patient), of which 78% of adverse events were classified as minor outcomes, 19% as moderate and 3% as serious outcomes with no deaths. The high incidence of adverse events and the high outcome severity in this study (25% major, 3% catastrophic) and others may be related to the high acuity of illness and the invasive nature of medical intervention in the intensive care unit setting. Although we did not study factors causing or associated with adverse events, another study7 showed that adverse events were related to young age, length of stay and severity of illness, but another study8 observed that only length of stay was important. The differences in the incidences of adverse events reported by the different reporting methods may be due in part to different roles of the two reporting groups: systematic enquiry by two doctors versus voluntary reporting by numerous nurses. Although there is some overlap of roles, doctors focus more on diagnosing and treating patients, whereas nurses focus more on delivering care. Consequently, each group may be more adept at recognising and more comfortable in reporting events stemming from different practices. Despite the lower yield from voluntary reporting, it is nonetheless valuable because it is likely to encourage a sustained culture of improvement among all staff. Nonetheless, voluntary reporting underestimates the incidence and severity of adverse events in the PICU environment. Of all adverse events, medication errors have been subjected to most attention, not only because they are numerous and serious in general medical1 and paediatric practice17 18 but also perhaps because they are more easily identifiable and perhaps more amenable to prevention than other adverse events. In another study, two systems of reporting worked well in tandem to detect and prevent medication errors: voluntary reporting excelled at detecting administration errors, whereas computerised surveillance detected errors associated with high-risk medications and evolving clinical status.19 In our study, medication errors constituted a major proportion (42%) of adverse events reported voluntarily and a substantial proportion (11%) of systematic reporting. Although numerous strategies have been proposed to prevent paediatric medication errors,18 recommendations about reporting methods were not considered. A substantial number of adverse events are due to care below an accepted standard. In a medical and legal analysis of the results of the Harvard Medical Practice Study of 1991, of the adverse events which occurred in 3.7% of hospitalisations, 27.6% were deemed negligent,18 which we assume would likely fulfil all of the requirements of a tort of negligence. We declined to apply the same legal assessment to events recorded in this study, but suffice to say that many appeared preventable and may not have occurred if accepted practices had been followed. At least one event is the subject of current legal action. The environment of the paediatric intensive care unit is hazardous for patients. Adverse events are common. Detection of these events is related to the method of reporting. Voluntary reporting is mainly conducted by nurses, is largely restricted to events of insignificant, minor or moderate consequences for the patient, and concerns medication errors. In contrast, systematic reporting by medical investigators captures events of more serious nature and is centred on diagnosis and management. It is recommended that systematic reporting of adverse events be adopted in addition to voluntary reporting by paediatric intensive care units. This would improve recognition of the nature and extent of adverse events as an important component in the development of preventive strategies. We thank M Merriman, for data related to admission numbers during our study, K Dunn, for commentary on the manuscript, B Carter, for some of the statistical analyses, and numerous nurses and doctors who responded to our questions.
. Incidence of adverse events and negligence in hospitalized patients. Results of the Harvard Medical Practice Study I. N Engl J Med 1991;324:370–6.
. Adverse events in New Zealand public hospitals: occurrence and impact. N Z Med J 2002;115:U271.
. Pitfalls of adverse event reporting in paediatric cardiac intensive care. Arch Dis Child 2004;89:856–9.
. Preventable harm occurring to critically ill children. Pediatr Crit Care Med 2007;8:331–6.
. Complications of care in a pediatric intensive care unit. Intens Care Med 1996;22:1098–104.
. Adverse events and preventable adverse events errors in children. Pediatrics 2005;115:155–60.
. A facilitated survey instrument captures significantly more anesthesia events than does traditional voluntary reporting. Anesthesiology 2007;107:909–22.
. Adverse events in the neonatal intensive care unit: development, testing, and findings of an NICU-focused trigger tool to identify harm in North American NICUs. Pediatrics 2006;118:1332–40.
. Patient safety problems in adolescent medical care. J Adolesc Health 2006;38:5–12.
. Medical record review of deaths, unexpected intensive care unit admissions, and clinician referrals: detection of adverse events and insight into the system. Arch Dis Child 2006;91:169–72.
. The critical care safety study: the incidence and nature of adverse events and serious medical errors in intensive care. Crit Care Med 2005;33:1694–700.
. Preventable adverse events in infants hospitalized with bronchiolitis. Pediatrics 2005;116:603–8.
. Medication errors in paediatric care: a systematic review of epidemiology and an evaluation of evidence supporting reduction strategy recommendations. Qual Saf Health Care 2007;16:116–26.
. Reevaluating the safety profile of pediatrics: a comparison of computerized adverse drug event surveillance and voluntary reporting in the pediatric environment. Pediatrics 2008;121:e1201–7. Ethics approval Ethics approval was provided by the Royal Children's Hospital's Human Research Ethics Committee.